This Eye-Catching Table Skirt for Trade Show Events Comes in Many Sizes! Choose the Color and Dimensions that Fit Your Tables! 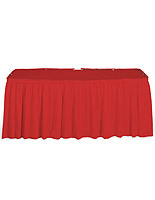 Purchase a Premium Table Skirt at a Low Price Right Now!  Solid white color is suitable for use during any occasion or event. Made from 100% polyester for easy maintenance. 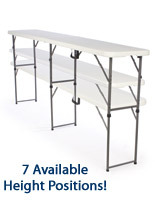 21-1/2'l skirting covers a round or rectangular table. Fast and easy installation with built-in hook and loop receptive strip. A table skirt, such as a tablecloth or linen cover, is the most budget-friendly alternative for you to dress up old registration or trade show tables. Add a throw to make any surface or display look more presentable. This table skirt is made from 100% polyester that is both machine-washable and wrinkle-resistant. The exceptional durability allows users to employ the skirting again and again. 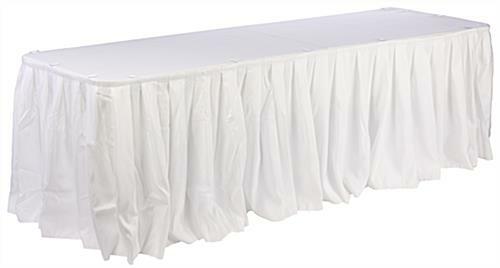 The white box pleat table skirt makes tables more elegant during formal and social events, including banquet dinners, hotel functions, conventions, receptions or trade show exhibitions. 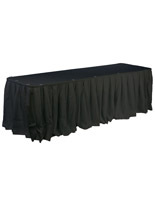 A cover, table skirt is engineered to fit round or rectangular tables. This tablecloth accommodates 72" round tables or 8' rectangular surfaces. Buyers can also set the table skirt up to cover only three sides of a 16' rectangular table, which leaves the back open for a sitting or storage area. The polyester fabric includes a hook and loop strip on the back, so attaching a topper and clips (sold separately) can be done without the need for push pins! 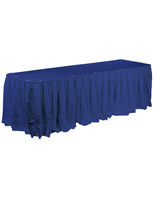 Our company offers this table skirt at a low price. Whether you are an individual shopper or professional caterer, the best prices are available here! Stop renting and invest in this table skirt!